If, like us here at Techniblock, you’re planning to escape the freezing rain, gale-force winds and dull grey skies for a warmer and sunnier climate in the next few weeks, we got some great tips to get your skin holiday ready and keep it in tip top condition whilst enjoying some sunshine. Introducing our gorgeous new skincare range from Tropic – an ethical, effective, exciting collection of products for the face and body. Discover indulgent textures and delicious scents guaranteed to get you beach ready. Packed full of natural ingredients like nourishing seed butters, fruit extracts and aromatic essential oils from tropical climates, Tropic is perfect for all skin types, even the most sensitive. A daily skincare range is one of the most important things you can do for your skin to ensure it stays blemish-free, soft, supple and young looking. The smoothing cleanser and nourishing skin cream concentrate will revive your skin after a day in the sun and Tropic’s vitamin toner is packed full of hydrating rose water, cucumber juice and Aloe Vera to keep you cool on hot days. Tropic’s Tamanu Healing Balm is an absolute skin saviour! This multi-purpose balm helps to repair all manner of skin aliments and calm irritated skin. Investing in a good quality insect repellent like Peaceful Sleep will keep the bites at bay in a tropical climate but if you are unlucky enough to get bitten, this balm will reduce redness and eradicate itching. After months of hiding our skin under layers of clothing, get your skin prepped for an even, golden Techniblock-glow with Tropic’s Body Smooth exfoliator. Containing mineral-rich sea salts to remove dead skin cells and polish skin and an invigorating blend of lemon myrtle, bergamot and lime essential oils for skin that’s super-soft and smooth. Last but not least, your feet! Tropic’s luxurious beach-inspired 3-step polish and repair collection contains ocean fizz foot soak, polishing foot pebble and repairing foot remedy. Now that you’re ready from your head to your feet for the beach, don’t forget your tried and trusted sun essentials. No holiday is complete without a high quality but easy to apply and long lasting sun protection and Techniblock certainly provides that. Available in SPF 30, SPF 40 and SPF 50+ Techniblock is non-greasy, dries instantly and highly water resistant. One application will keep your skin sunburn-free and the light, oil and fragrance-free formula offers a breathable barrier that won’t irritate sensitive skin prone to prickly heat. 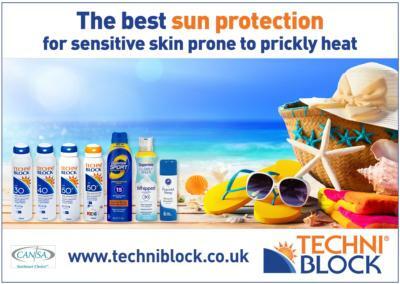 Also available in a Children's Range Techniblock SPF 50+ for kids offers very high protection for young and delicate skin. Want a lower SPF? Check out our new SPF 15 from Coppertone - a durable and non-sticky sun protection that won't clog pores or cause breakouts.